The other day, I came across the story of a grisly thirteenth-century murder which took place in London’s Ironmonger Lane, now a clean and bright, bricked side-street a stone’s throw from the Guildhall. The murder was recorded in London’s detailed coroners’ rolls, and the killer was never brought to justice, despite everyone knowing who it was. The circumstances of the case show just how easy it could be to get away with murder in the Middle Ages. as soon as this Roger saw that the said Simon was asleep, he seized a knife and cut Simon’s throat so that the head was entirely severed from the body. After this, he dragged the body out and put it in a certain secret spot, a dark and narrow place between two walls in the same house, where coals were usually kept. The next day, Roger went to work in the tavern, as usual, telling the neighbours that Simon “had gone to Westminster, to recover some debts,” and he did the same for the following two days. At twilight, however, on the third day, he departed by the outer door, locking it with the key, and carrying off with him a silver cup, a robe, and some bedclothes which had belonged to the same Simon. Afterward he returned, and threw the key into the house of Hamon Cook, a near neighbor, telling him that he was going to seek the said Simon, his master, and asking him to give him the key if he came back. A few weeks later, Hamon gave the key to a man to whom Simon had owed some money, as it seemed neither Simon nor Roger was going to return. The man took his due from the tavern and left. Months later, at Easter, the landlord allowed a new tenant into the building, and it was the new tenant who discovered Simon’s headless body in the coal storage area. His head, incidentally, was never found, nor was Roger of Winchester. The circumstances would indicate that Roger was the culprit, and although this cannot be proved without a reasonable doubt, the wording of the records indicates that this is definitely what happened – the description of the murder reads like the testimony of a witness despite the fact that there were none. In the thirteenth century, people were much more comfortable with accepting circumstantial evidence as fact. There are no more forensic details recorded, so it is impossible to know if Simon was actually killed in his sleep or on his feet, although obvious signs of a struggle, such as other knife wounds, would very likely have been noted if the body hadn’t been so badly decomposed. This is probably why the coroner concluded Simon was asleep. However, bedclothes could be valuable, and it is noteworthy that Roger took them from the house along with a silver cup and a robe (also easy to sell for quick cash) on the day he left. Because no DNA or blood type could be gleaned from bloody bedclothes, and Roger didn’t attempt to dispose of the body more permanently, he most likely took the bedclothes to sell – not to hide evidence – in which case, it’s unlikely that they were covered in blood (and therefore, Simon was probably not in them when he was murdered). Some other elements of this case give us interesting clues into medieval life and murder. The fact that the neighbours immediately noticed Simon’s disappearance shows the closeness of medieval communities, and how in some ways it would have been difficult to commit such a crime and get away with it. People knew each other’s business and noticed deviations. At the same time, with journeys routinely taking a long time, a lie such as Roger’s wouldn’t immediately arouse suspicion – in this case, giving him three days to put together an escape plan. The fact that Roger was a relative stranger was the key to his getting away with the crime: because he had not been in Ironmonger Lane long enough to establish friends or habits, the usual network of neighbours and friends could not be used to trace him. The coroner’s investigation into the murder of Simon of Winchester also demonstrates routine detective work that we may not often give medieval people credit for. The investigators recorded details, such as where the body was found and the cause of death; they noted times, places, and important details, such as the ongoing argument between the two men directly before the murder; and they asked questions just like detectives do today: who had access to the building? Who was seen around this time? Any suspicious noises or activity? Sadly, despite their diligence, Roger’s transience made him untraceable in the end. 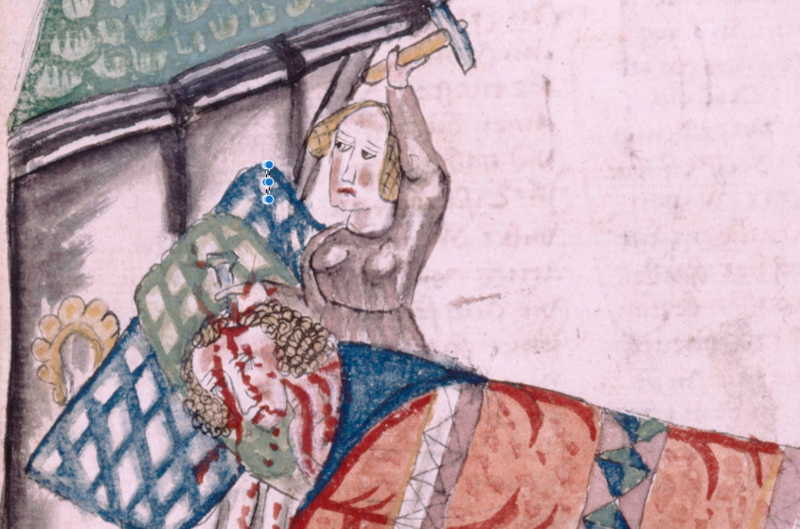 You can find Simon of Winchester’s murder, and other untimely deaths, in Emilie Amt and Katherine Allen Smith’s Medieval England, 500 – 1500: A Reader, along with a whole bunch of other snippets of interesting primary sources.